While everyone was always head-over-heels crazy for Nirvana singer/guitarist Kurt Cobain, bassist Krist Novoselic has become the truly interesting sort. 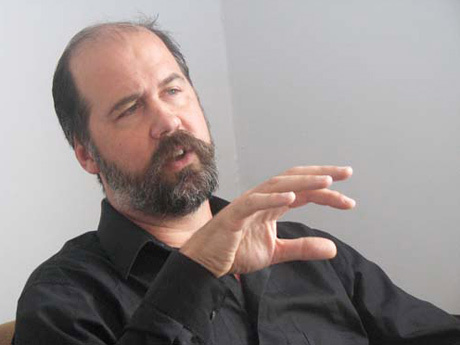 After a few one-off albums and singles, Novoselic disappeared from music and the media in general. He's back now, but not as one would expect. Novoselic has announced that he's running for clerk of Wahkaikum County in Washington state. In case you're wondering what a county clerk does, they're the ones responsible for election administration, the collection and filing of vital records such as birth certificates, death certificates and marriage licences. Fun stuff when compared to boring things like drinking, playing music and touring. According to Novoselic, he is running in the miniscule county of approximately 4,000 people not because of a vested interest in politics. He's actually out to prove a point/protest a policy, and admits that he actually has very little enthusiasm for the political process. As Spinner reports, Novoselic is bothered that the state of Washington allows candidates to choose their affiliation without party approval. In his column for the Seattle Weekly, he delves deeper into the issue: "I am officially running for office, and under the laws of the State of Washington, the ballot will say: Krist Novoselic Prefers Grange Party. Of course, there is no such thing as a Grange Party," noting that someone can portray themselves as being from any party creating misleading/misunderstood situations. Novoselic also promises to continue discussing and informing about the status of his running in future columns, so we can all follow along.